Although RFM has been used by direct marketers for more than 40 years, it is amazing how few current day marketers know how it works and why it works. RFM stands for recency, frequency, monetary amount — the three key elements in customer behavior that help to predict whether a person will respond to a promotion. RFM is the basis for any valid predictive model. It always works. There are many methods for calculating RFM. Some are quite complicated. I use a simple one which is easy to understand and calculate. For recency, you need a single date in the customer’s database record: the most recent purchase date. You sort all of your customers by that date and divide them all into five equal (20%) groups coding the most recent as “5” the next group (quintile) as “4” etc. When you do a promotion to your customers, you will find that most of them do not respond at all. But of those that do, the “5s” will do the best.. The “1s” will have a very low response rate. Why does recency work? Because everyone gets a certain pleasure after buying a new product: a car, a dress, an insurance policy, a bank account. If you get a letter from the insurance company in the following week, you will open that letter. Maybe it is about your new policy. If, however, you bought the policy five years ago, and you get a letter from the company, you may throw it out unread. Recency is a very powerful factor in response, but it degrades with time. Frequency is done the same way. Put into all customer records a single number: the number of times that they have made a purchase. Sort your entire customer base by that number and divide the base into five equal parts, calling the top group “5”. When you do your next promotion, you will find that the most frequent buyers respond better than the less frequent ones — but the effect is not as powerful as the recency quintile differences. Recency is more powerful a predictor than Frequency. Finally, you need to create a monetary figure in everyone’s database record: the total amount that they spend with you per year, or per month. Do the sorting and dividing the same way. In a mailing, the 5s will do better than the other groups, but not by much. 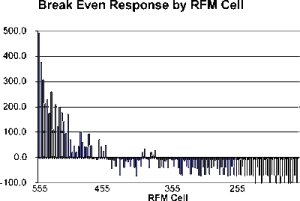 Except for big ticket items, monetary tends to result in a flat graph. Once you have finished the above exercises, all your customer records have three new numbers ranging from 555 down to 111. 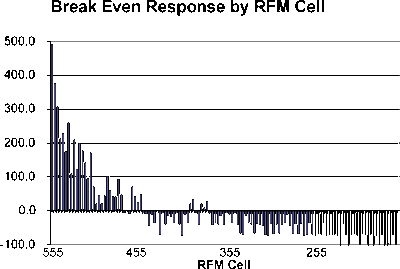 There are 125 RFM cells in all (5 X 5 X 5). When you do a promotion to your customer base, the response by cell will show that some cells are profitable, and that many cells fail to break even. Break even occurs when the profits from purchases by the customers in a cell exactly equal the costs of mailing to them. In a graph of profits (and losses) by cell, the highest ranking cells will make a profit. Most of the lower cells will lose money. Don’t mail to the unprofitable cells and your profits will zoom. A mailer with a 2 million name customer database coded his file with RFM cell codes. He ran an RFM test with 30,000 customers. Then he selected the 34 profitable cells (out of the 125 total) to mail for the rollout. He was selling a $100 video which generated a $40 profit on each sale. By mailing only a half million of his customers he turned what would have been a $164,000 loss into a $307,000 profit. His response rate jumped from 1.17% to 2.76%. That is what RFM is: a way of improving profits by not mailing cells that you know by testing will not break even. To run RFM properly, you have to sort your database 31 times (not three times). Sort first by Recency and divide into five groups. Sort each group separately by frequency and divide each into five groups. Finally sort each of the 25 groups by monetary and divide. All the cells will be of equal size. You can do the sorting yourself, or you can download free software from www.dbmarketing.com. Recalculate RFM after every mailing. Using RFM is like taking drugs. It gives you such a high that you want to do it all the time. That would be wrong. If you use RFM exclusively to guide your mailing, your lowest ranking customers will never hear from you. Your highest ranking customers will suffer from file fatigue. You have to develop a customer contact strategy so that everyone hears from you at some time during the year. But RFM tells you which customers will respond. So you can heavy up on these responders. Mail them when times are rough for you, they will help you out. It is almost like magic. RFM is not as important in the electronic world. The profits from RFM come from not mailing low responders. That is important if your in-the-mail cost is $0.40 or more. But if your email promotions only cost you a few pennies, why not mail them all? Good question.